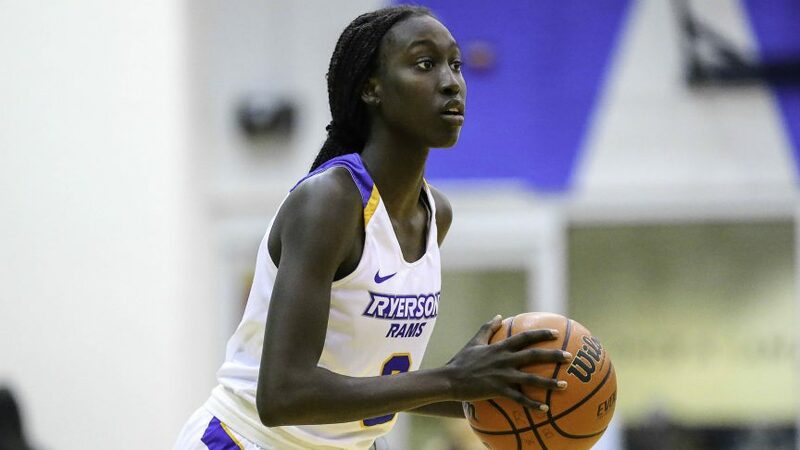 Despite fighting back a series of runs by the Carleton Ravens, the Ryerson Rams women’s basketball team fell to the latter on Jan. 5, losing 78-70 at the Mattamy Athletic Centre. Coming off the break, the Rams were coming off their first loss of the season on Nov. 30 against the Lakehead Thunderwolves. In that game, Ryerson struggled to score, shooting a mere 35.5 per cent. Unfortunately, it wouldn’t get much better for the home team against the stingy Ravens, as they’d shoot 42.9 per cent in the loss. It didn’t seem like it was going to end that way early on, however, as the Rams were led by one of their stars. Clearly energized from the sold out court and passionate supporters from both sides, Ryerson danced around some shaky defence to kick things off with a bang. Thanks to the impressive 12-point first quarter of second-year forward Jama Bin-Edward, the Rams managed to keep things tied heading into the second. Despite this, the Ravens answered early in the second, promptly going on a 10-0 run spearheaded by Stoney Creek, Ont. native Alyssa Cerino, who forced the Rams into a mid-quarter timeout with a layup. Carleton would continue to ride their momentum to a 35-30 lead at the half. The Rams wouldn’t be kept down for long, though, as they clawed their way back with vengeance, aided by some phenomenal blocks in the paint and Hayley Robertson’s pivotal early quarter three-pointer. Quietly yet confidently, the Rams entered the fourth quarter ahead by five. As the crowd grew increasingly anxious, the Rams fought hard in the tense final quarter. Though they kept it close until the last few minutes, the Ravens would eventually pull away, outscoring the Rams 31-18 in the final frame. Bin-Edward would lead the Rams in scoring, finishing with 20 points on 8-18 shooting, while Ravens guard Madison Reid had 20 points of her own on 7-13 FG. UP NEXT: The Rams host the Ottawa Gee-Gees at Coca-Cola Court in a Sunday matinee on Jan. 6. Tip-off is scheduled for 2 p.m.